UPDATE ON 9/18/17: The version of the bill that passed in the Pennsylvania House of Representatives takes $50 million from the Pennsylvania Public Transportation Trust Fund instead of the originally proposed $357 million. 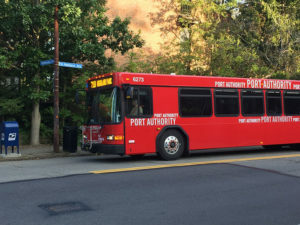 This would still impact the Port Authority of Allegheny County and could result in service cuts and/or fare increases. The article below has been updated. For many people with disabilities, public transportation and ACCESS service provide a crucial link to the world. A plan put forth by a group of state legislators would cut funds from the Port Authority of Allegheny County. The bill has already passed in the Pennsylvania House of Representatives and has moved to the Senate for consideration. The Port Authority’s buses, light rail, inclines, and ACCESS service transport 100,000 riders a day. The legislation would take money from Pennsylvania Public Transit Trust Fund. Transit systems across the state would face similarly devastating cuts. A related move takes money from the state’s Multimodal fund would hinder projects that include ADA improvements throughout Pennsylvania. Find your state legislators here and speak out against the plan.